Arthur Nozik hopes quantum dots will enable the production of more efficient and less expensive solar cells, finally making solar power competitive with other sources of electricty. No renewable power source has as much theoretical potential as solar energy. But the promise of cheap and abundant solar power remains unmet, largely because today’s solar cells are so costly to make. Photovoltaic cells use semiconductors to convert light energy into electrical current. The workhorse photo­voltaic material, silicon, performs this conversion fairly efficiently, but silicon cells are relatively expensive to manufacture. Some other semiconductors, which can be deposited as thin films, have reached market, but although they’re cheaper, their efficiency doesn’t compare to that of silicon. A new solution may be in the offing: some chemists think that quantum dots–tiny crystals of semi­conductors just a few nanometers wide–could at last make solar power cost-competitive with electricity from fossil fuels. By dint of their size, quantum dots have unique abilities to interact with light. In silicon, one photon of light frees one electron from its atomic orbit. 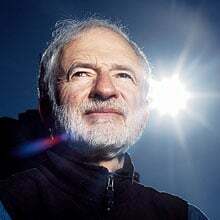 In the late 1990s, Arthur Nozik, a senior research fellow at the National Renewable Energy Laboratory in Golden, CO, postulated that quantum dots of certain semiconductor materials­ could release two or more electrons when struck by high-energy photons, such as those found toward the blue and ultraviolet end of the spectrum. In 2004, Victor Klimov of Los Alamos­ National Laboratory in New Mexico provided the first experimental proof that Nozik was right; last year he showed that quantum dots of lead selenide could produce up to seven electrons per photon when exposed to high-energy ultraviolet light. Nozik’s team soon demonstrated the effect in dots made of other semiconductors, such as lead sulfide and lead telluride. These experiments have not yet produced a material suitable for commercialization, but they do suggest that quantum dots could someday increase the efficiency of converting sunlight into electricity. And since quantum dots can be made using simple chemical reactions, they could also make solar cells far less expensive. Researchers in Nozik’s lab, whose results have not been published, recently demonstrated the extra-electron effect in quantum dots made of silicon; these dots would be far less costly to incorporate into solar cells than the large crystalline sheets of silicon used today. To date, the extra-electron effect has been seen only in isolated quantum dots; it was not evident in the first proto­type photovoltaic devices to use the dots. The trouble is that in a working solar cell, electrons must travel out of the semiconductor and into an external electrical circuit. Some of the electrons freed in any photovoltaic cell are inevitably “lost,” recaptured by positive “holes” in the semiconductor. In quantum dots, this recapture happens far faster than it does in larger pieces of a semiconductor; many of the freed electrons are immediately swallowed up. The Nozik team’s best quantum­-dot solar cells have managed only about 2 percent efficiency, far less than is needed for a practical device. However, the group hopes to boost the efficiency by modifying the surfaces of the quantum dots or improving electron transport between dots. The project is a gamble, and Nozik readily admits that it might not pay off. Still, the enormous potential of the nanocrystals keeps him going. Nozik calculates that a photovoltaic device based on quantum dots could have a maximum efficiency of 42 percent, far better than silicon’s maximum efficiency of 31 percent. The quantum dots themselves would be cheap to manufacture, and they could do their work in combination with materials like conducting polymers that could also be produced inexpensively. A working quantum dot-polymer cell could eventually place solar electricity on a nearly even economic footing with electricity from coal. “If you could [do this], you would be in Stockholm–it would be revolutionary,” says Nozik. A commercial quantum-dot solar cell is many years away, assuming it’s even possible. But if it is, it could help put our fossil-fuel days behind us. Boeing Spectrolab already achieved 40% solar cell efficiency and various solar energy experts expect solar energy to be cost-competitive with electricity from fossil fuels within 10 years. The technology you're talking about isn't about to become economically competitive any time soon... those are multi-junction solar cells, complex stacks of several different types of material that need to be grown under very exacting MBE processes. Quantum dots, on the other hand, are grown in a beaker, and therefore much cheaper to produce. I wonder what would happen if they combine the technology and add solar concentration to the equation? Lets see they claim 40% efficiency with solar concentration, 40% with multi-junction solar cells, and do quantum dotting 40% efficiency what happens then? Sig: When scientist stop asking questions does it mean they know it all or is what they know suppressed? This is totally irrelevant as thin film GaAs IS NOT quantum dots. Not to mention a cost of $1,000 per WP or more. This technology is useful in space or DOD apps where $ is no object, or in concentrator applications where 500:1 gain reduces cost to $2 WP, that works with the various cheap concentrator technologies launched or in development in CA. Even better, can it be incorporated into standard roofing tiles and windows?? There are at least 4 silicon valley companies well along the road to commercializing q-dot solar, so more likely 20 in the world. EQE of 8% plus has been demonstrated at the materials level. We expect to see by mid-2008 at least two commercial products being sampled. Projected production cost is 50 cents per WP using roll to roll printing techniques. With all due respect to NREL government researchers do not usually drive commercial products. Equally important is to bring the total cost of installation down. The recent glut in solar PV at sub $/watt price reveals that bringing the cost of manufacturing down did not help in lowering the total cost of installation. It created a wider profit margin for solar installers which was not passed down to consumers. Yes, some manufacturers modified solar panels so that it can be easily installed by solar installers, requiring minimal labor and so it saved solar installers labor costs, and then again, this savings was not passed down to retail customers. So even if the solar panels were free, and are faster to install, the total cost of installation remained the same, at levels that will not compete with retail price of electricity. The solar installers remained the last mile bottleneck of wider solar PV adoption. They also jack up the prices of their installation because they know you will have rebates and want all of it in their pockets by jacking up their prices. If you compute the finance charges on the actual price paid for (government money and your expenses), you will find out that in almost all instances, that finance charges will be greater than the value of the electricity produced by the solar panels. This is because of the very high installation costs, whose profits are mainly pocketed by only one segment of the solar industry, the installers, and they aren't budging to lower their prices. One of the solution to this bottleneck problem is to encourage DIY installations, by making it so easy and almost fool-proof installation. Manufacturers can now make solar panels and its system so that it can be easily by retail customers having an average skill. If they can assemble a portable picnic shade canopy, they should be able to plug n play the new solar PV designed with minimal skills of installations.